Cardi B and Ozuna perform onstage at the 2018 Billboard Latin Music Awards at the Mandalay Bay Events Center on April 26, 2018 in Las Vegas, Nevada. 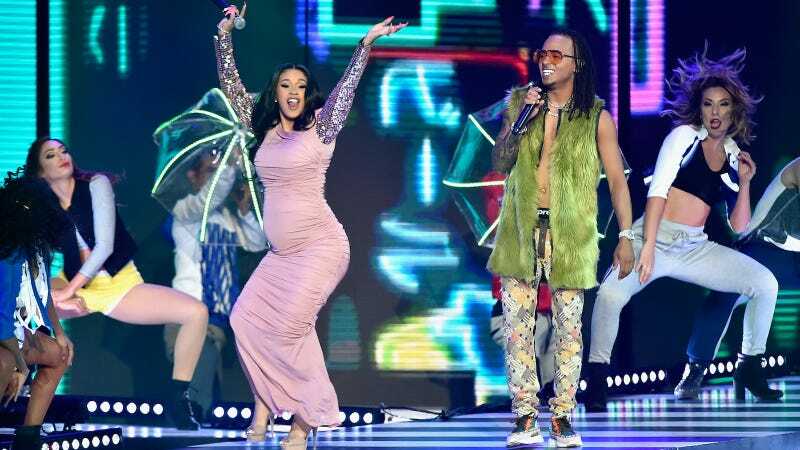 Cardi B popped out to perform “La Modelo” with Ozuna at Thursday night’s Billboard Latin Music Awards, and something else looked like it was about to pop out too: A BABY. Cardi recently cancelled a host of summer tour dates, and though her due date is reported to be sometime in July, the belly don’t lie. Though bodies and how pregnancies are carried differ by individual, I wouldn’t be tooooooo surprised if the baby dropped in June, just in time for a summer banger. Unfortunately, Cardi did not perform future-hit-of-the-summer “I Like It” with J Balvin and Bad Bunny, who were also in attendance, but at least we can dream for the Latin Grammys or some such. She did look like she was having a blast, as ever.